They say that August and September are our rainy seasons in Catalunya, but after the past four days of continual rain, I’m guessing that October will give the weather forecasters a run for their money. The mornings have brought waves upon waves of thick heavy clouds rolling over the mountains, a tidal wave of humidity. It’s breathtaking in the morning, and a bit humbling, recognizing how majestic and uncontrollable nature is. By the afternoon, the clouds have built upon themselves forming a thick suffocating white blanket over your head, and by 3pm, truck loads of water begin to fall, creating a melancholy feeling in our house. I love rain. I love the cozy, comfortable feeling it brings, but when deciding which Spanish wine we should try on the fourth day of overcast, you’re thinking tequila and a piñata. Fortunately, our tequila stock is non-existent, so instead, we chose the most attractive and quirky bottle on our shelf, the 2005 Mertixell Palleja Nita. Mertixell Palleja is a small winemaker in the Priorat who named her first biodynamic wine after her grandmother’s home, Cal Nita. The ornate bouquet of flowers set upon the off white label looks Russian in its design with simple black lines outlining red and gold petals. 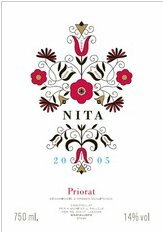 Different from any other label of seen from the Priorat, not only for its classy design, but for its purpose: to drink the wine on the lunar cycle of fruit or flower. And to be honest, I don’t know what this means. Which days are categorized as “flower” days and which are “fruit” days. Nor do I know where to find this information. I’ve hunted several websites not only looking for information on the winemaker, herself, but also on the lunar calendar. But unfortunately, I seem to continually come up empty handed on both accounts. What I did find was Meritxell’s phone number, not to a bodega, but to her. Although she was gracious and cordial when chatting with me, she made it clear that my timing couldn’t be more appropriate, leading me to wonder if the number wasn’t her cell. She did, however, promise to send more information on both herself and the wine, which I will promptly post when it zips through my mailbox. The 2005 Nita was absolutely gorgeous, fragrant and inviting. Made with 45% Garnacha, 35% Cariñena, 15% Cabernet Sauvignon and 5% Syrah, the color is clear deep cranberry red. So intense is the color that it almost appears metallic with a gorgeous aromas of lavender, black cherry, plum and white pepper with subtle aromas of both violet and wet slate. Enticing, bright acidity, firm tannins and medium body integrate seamlessly, showing black earth, dark red fruit and gentle spices on the palate. It’s a steal should you find it!